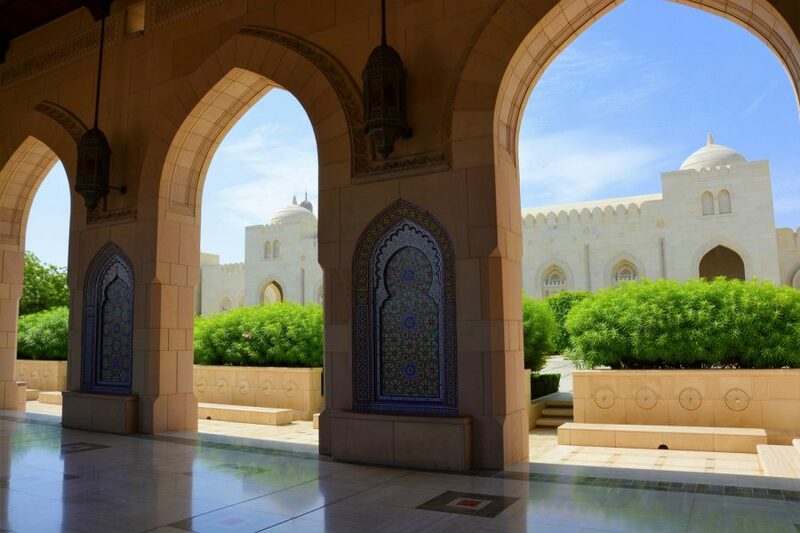 We traveled to Oman a year ago and it charmed us. 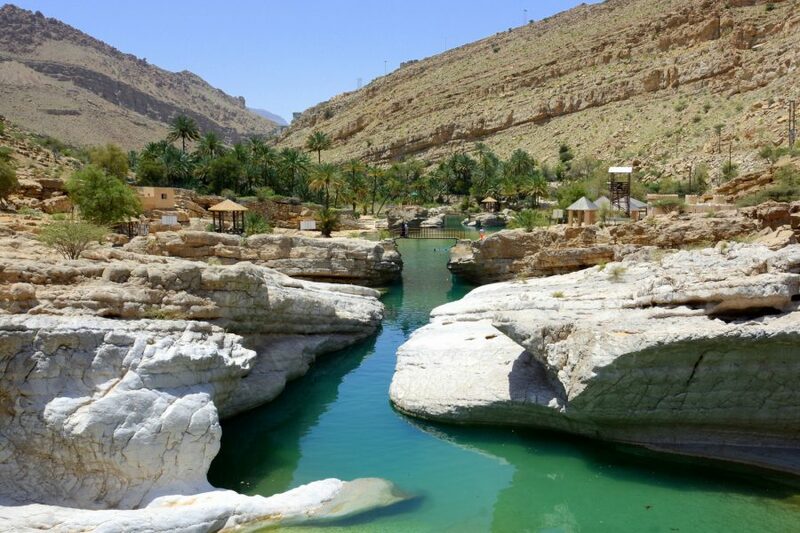 We had some prejudices that proved wrong about Arabic world and now we can affirm without doubt that traveling around Oman is beautiful, almost fairytale-like and very safe. As many of you are flirting with idea to go to this country, I decided to write down our travel itinerary. 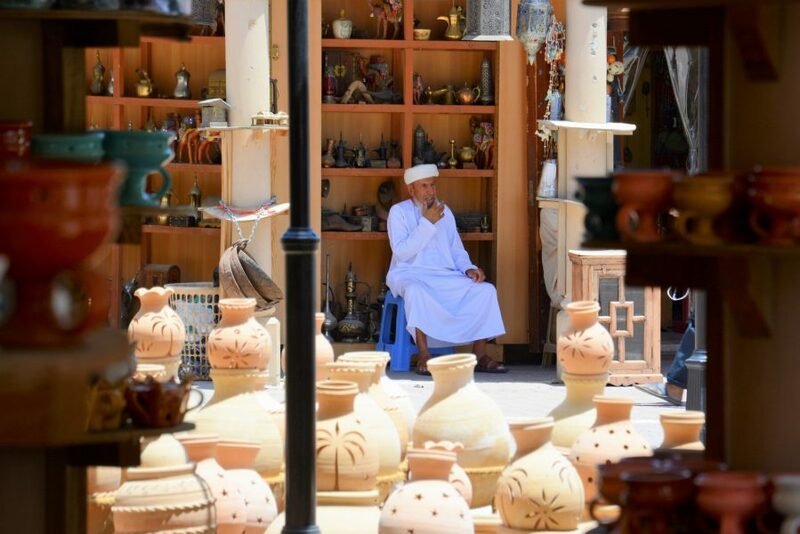 When to travel to Oman? We went there at May holidays, but that isn´t ideal time. It was crazy hot and temperatures were among 35 to 40°C during the day. 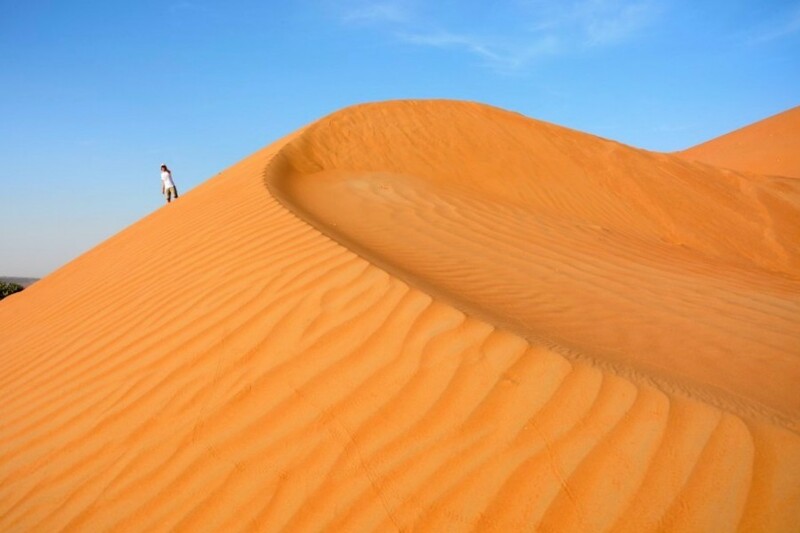 The best time to travel to Oman are holidays in November or New Year´s holidays. 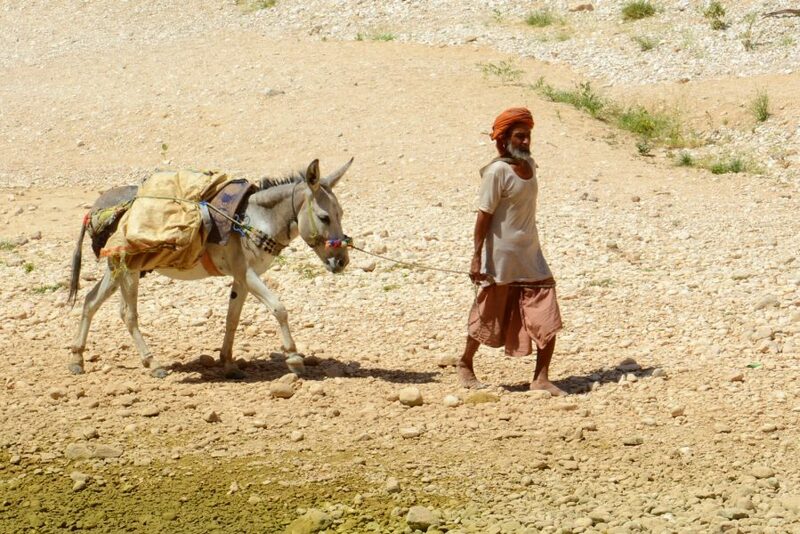 Avoid going there between May and October, as the heat is unbearable. Moreover, combination of heat and air-conditioner can lead to a cold. The more time you have the better. However, because I know that many of you don´t have weeks of holidays, I can calm you down. 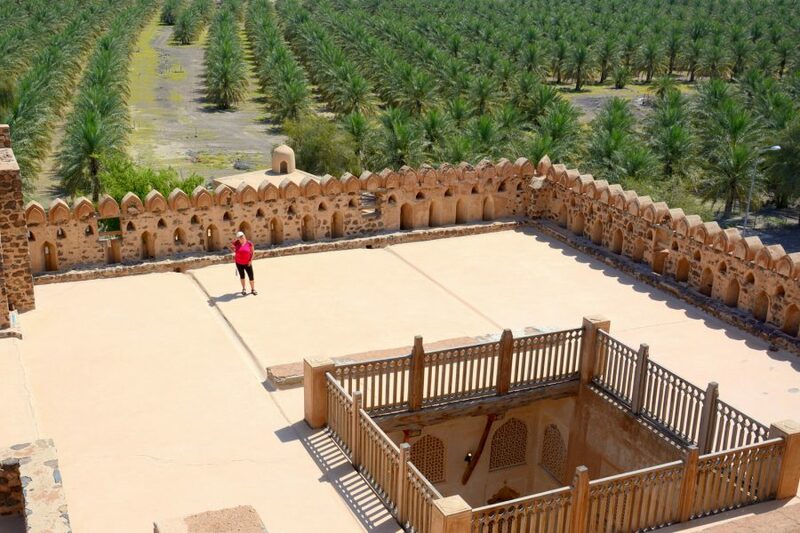 Even if you have just a week, you can experience Oman and explore it at least one part, but it is best to have 10-14 days. In this article, I will describe our journey, for which you will need 7 to 10 days, without being in a hurry. 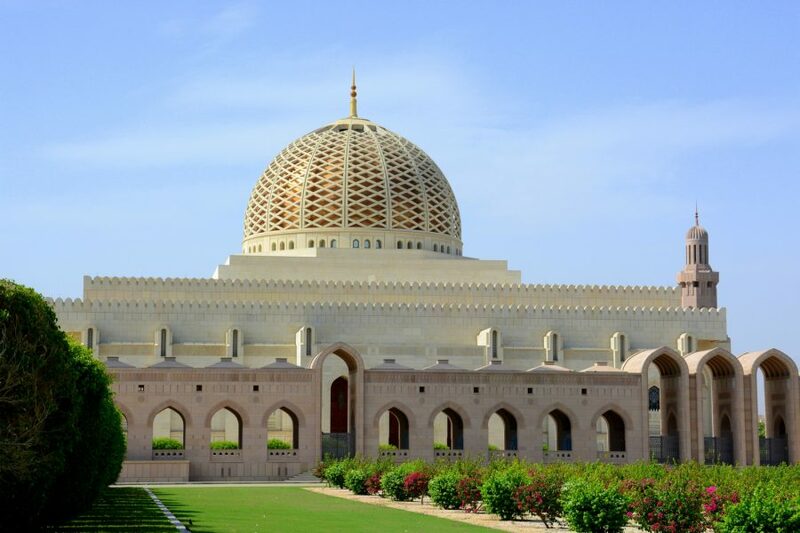 Many travel to Oman in combination with Dubai and go to the wonderful Sheik Zayed Mosque in Abu Dhabi. That´s what we did. 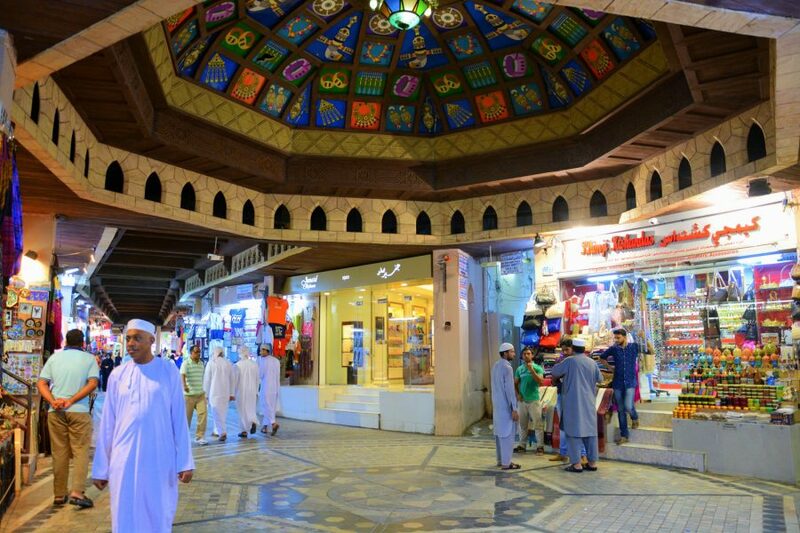 We flew to Dubai, took a day to see Abu Dhabi and magnificent mosque and continue to Oman. 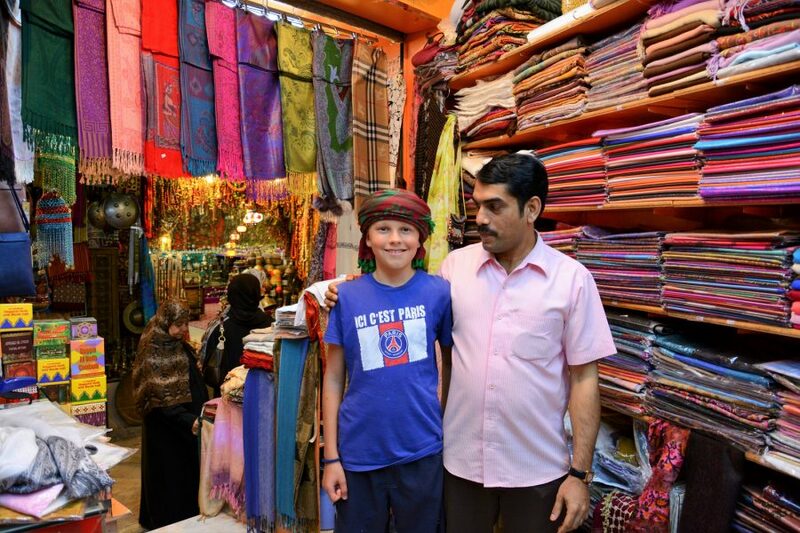 After returning from Oman, we had a day and a half to explore Dubai. It was enough for us, maybe for some of you it wouldn´t be – so do as you wish. You have to be attentive when planning visit to mosques (in Muscat and in Abu Dhabi) as they are closed for tourists on Fridays. 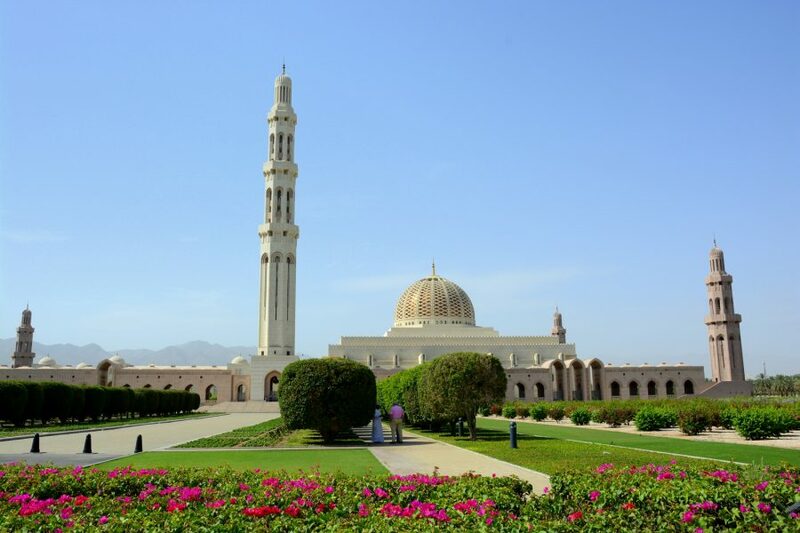 You can also pick direct flight to Muscat and gain an extra day or two in Oman. I can say without a doubt that Oman is very safe country with extremely kind people (and that is not fake kind), that are willing to help anytime. Without asking or expecting anything in return. 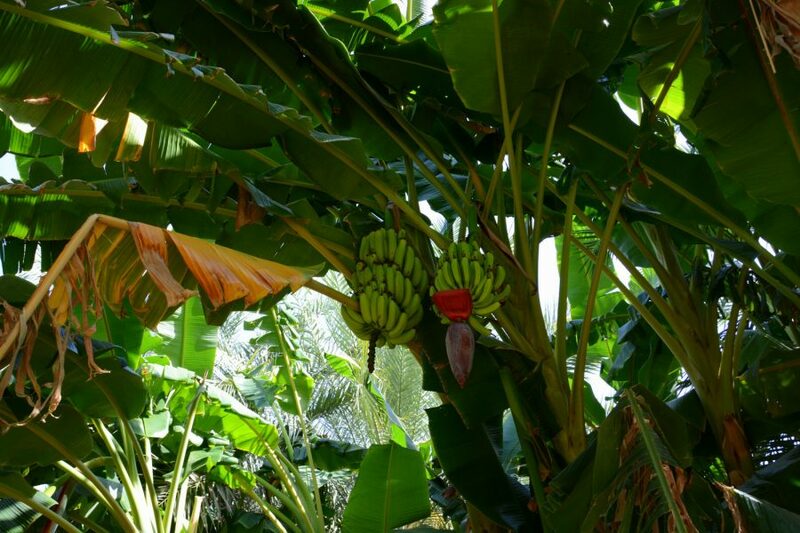 That was a pleasant surprise as you don´t experience it often around the world. 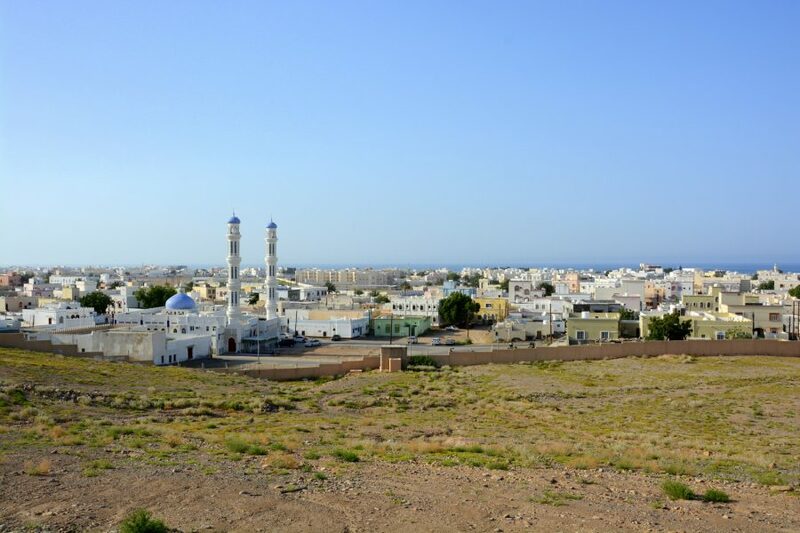 There is a belief that Oman is very expensive country. 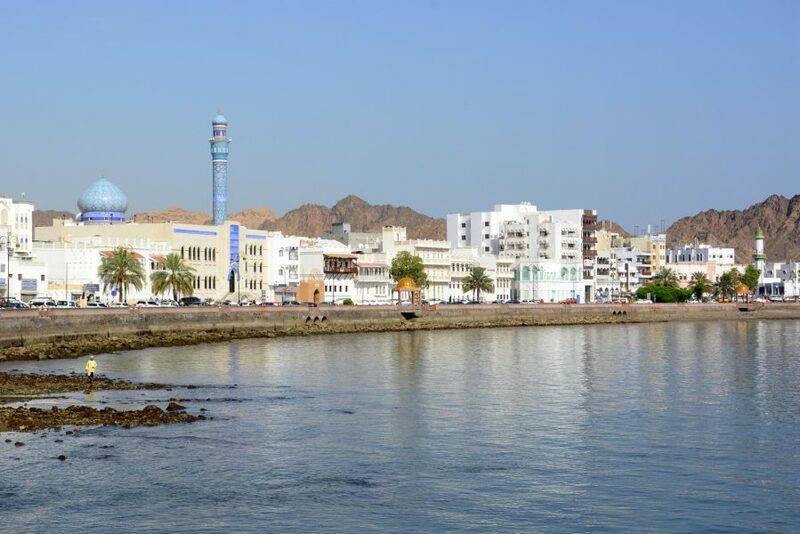 Standard in Oman is high, that is true, and prices in luxury hotels and restaurant are not cheap. But we didn´t choose hotel restaurants. We ate in local restaurant and paid 18 to 25 euros for a meal for four persons. We didn´t have any problems with food or digestion, but we were attentive that everything was well prepared. The gasoline prices are low and there are almost none entry fees. The highest expense was for spending the night, where we paid between 60 and 100 euros per night for four persons. 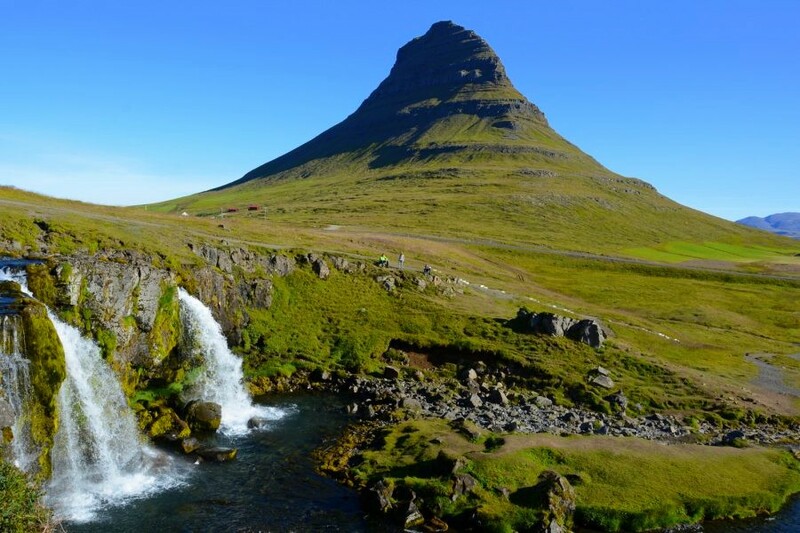 You can lower this expense with camping, which is allowed and free. We intended to that as well, but were surprised by the heat and it would be just too much for kids to camp at 40°C without any shade, so we found other options on-site. 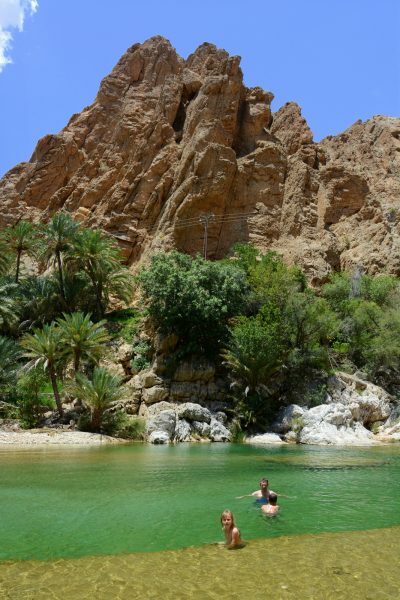 But it is possible to camp in Oman, especially if you go there in our Autumn or Winter. In this case the highest expense would be hiring a car. Ne, not necessary, especially because the price is quite high. 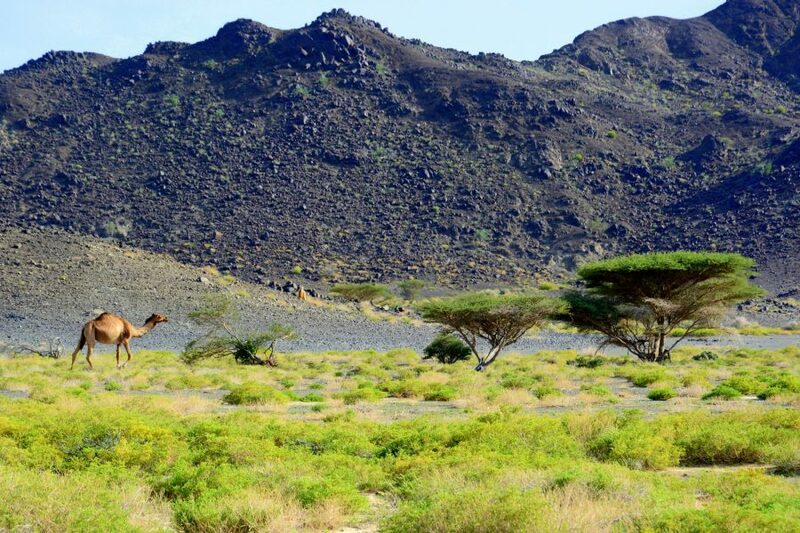 But it is necessary if you want to explore mountainous part of Oman. For Jabel Shamsa (great canyon of Arabic world) is enough if you rent a ordinary car, but for Jebel Akhdar you need 4 wheel drive. You don’t need 4W for access to Wahiba red dunes, but if you have enough time and intend to go to white dunes on south, you should take 4 wheel drive. 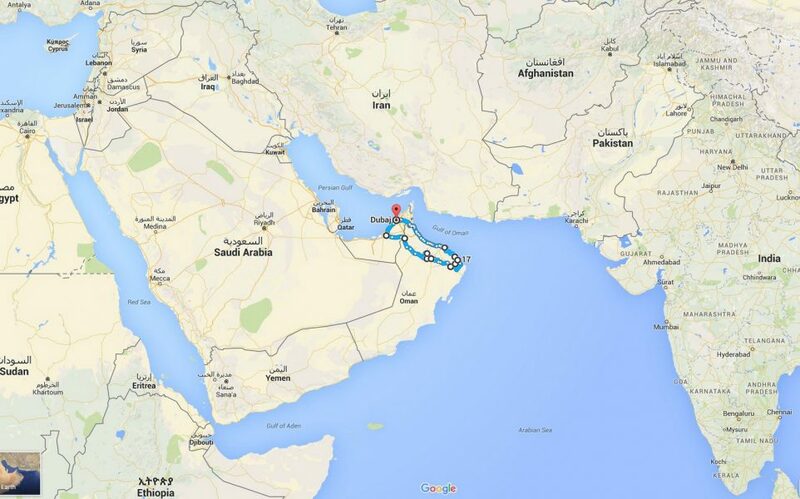 You start in the morning in Abu Dhabi and go towards Oman. 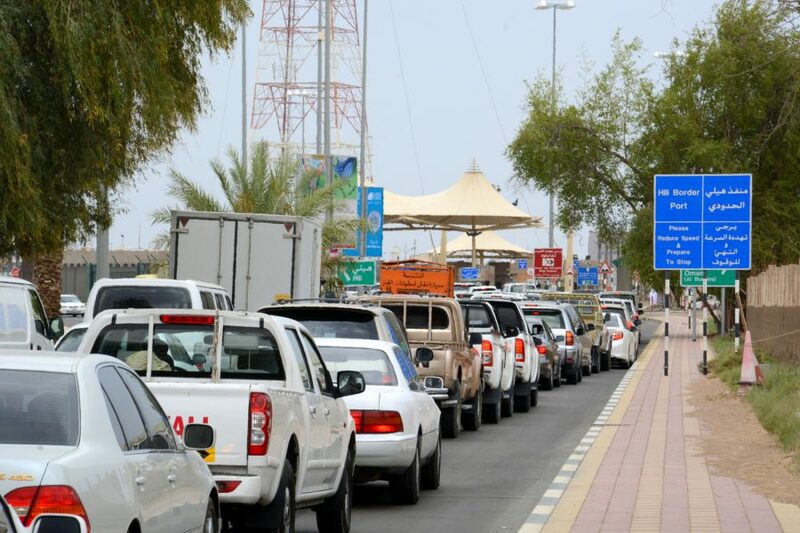 It can take two hours or more to cross the border in Al Ain, so take your time. 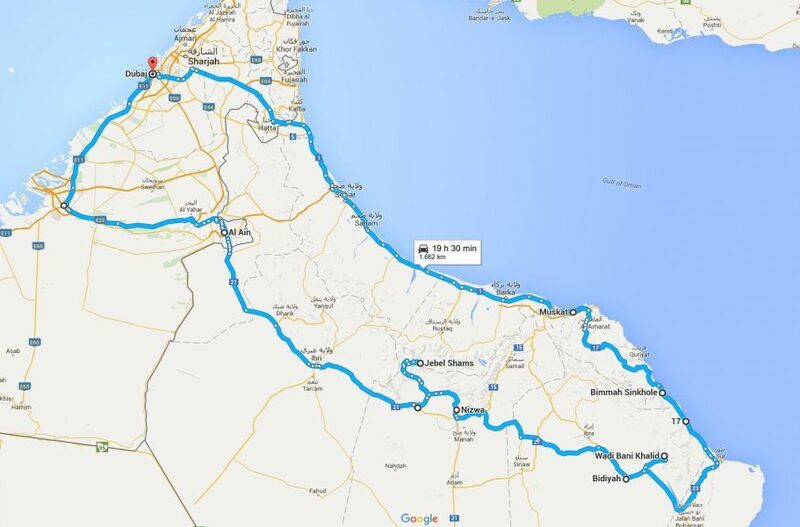 There are two border crossings near Al Ain and we recommend shorter path on south border crossing. 400 km from Abu Dhabi to Bahla doesn´t sound much for a day, but we started at 11 a.m. and reached Bahla in the dark, because there was crowded on border crossing. When crossing a border you have to pay fee for leaving United Arab Emirates and visa for Oman. They accept only cards, no cash. You have to have car insurance that is valid in Oman as well. You should take care of that prior to your trip, at home, as it is obligatory. From all rent-a-car agencies on the airport, only Dollar provide it (in April 2016). I recommend that you spend your first night in Bahla as it is the best starting point for exploring mountainous parts of Oman. We spend the night in Jibreen Hotel that we recommend. 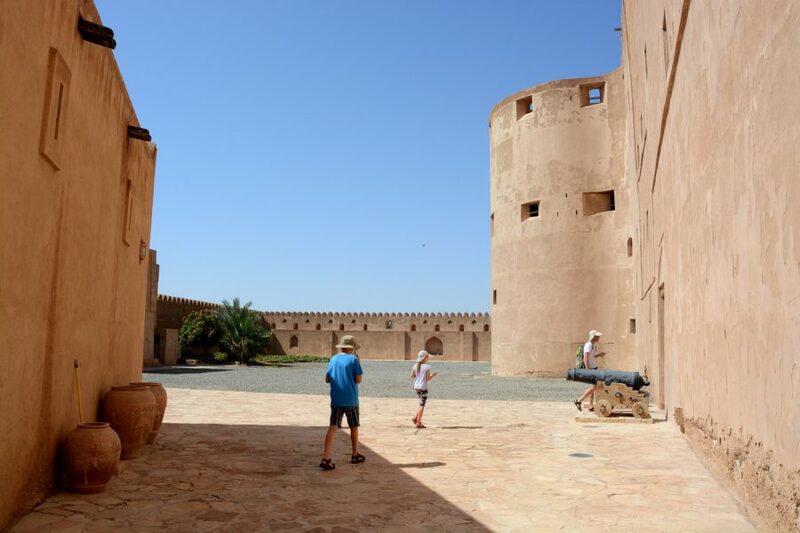 In the morning, go to wonderful Bahla fort that is under Unesco protection. Be early as it will be hot soon. The fort is open from 8,30 a.m. to 4 p.m., except on Fridays, when it is open from 8 a.m. to 11 a.m. 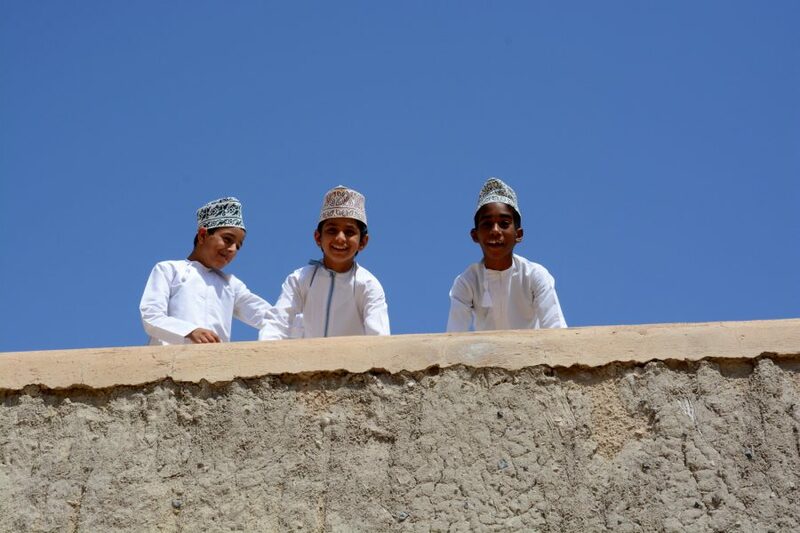 It is something mystical in walking on walls and hidden rooms without crowd of tourists, when only bets and Oman´s pupils keep you company. Really beautiful experience. After visiting fort, go to the mountains, to Jabel Shamsa, great canyon of Arabic world, to cool down. 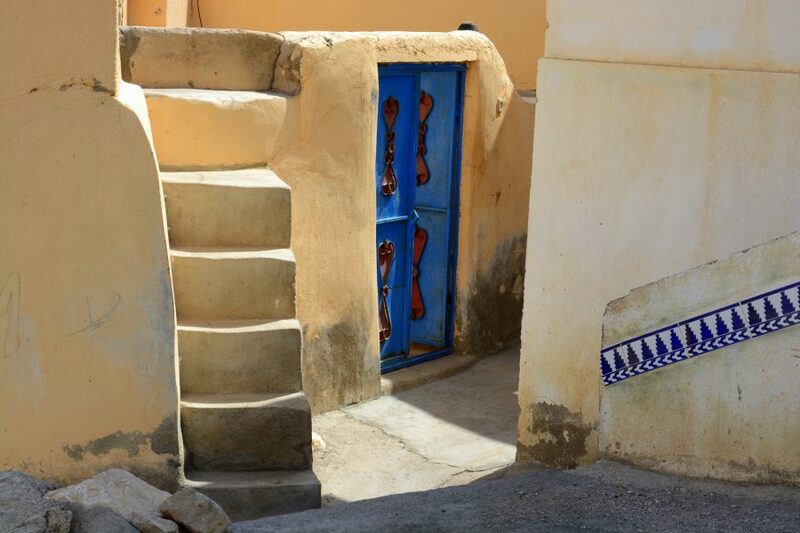 If you hired 4W, go to idyllic village Bilad Sayt and spend a night there. Or go back to Bahla. 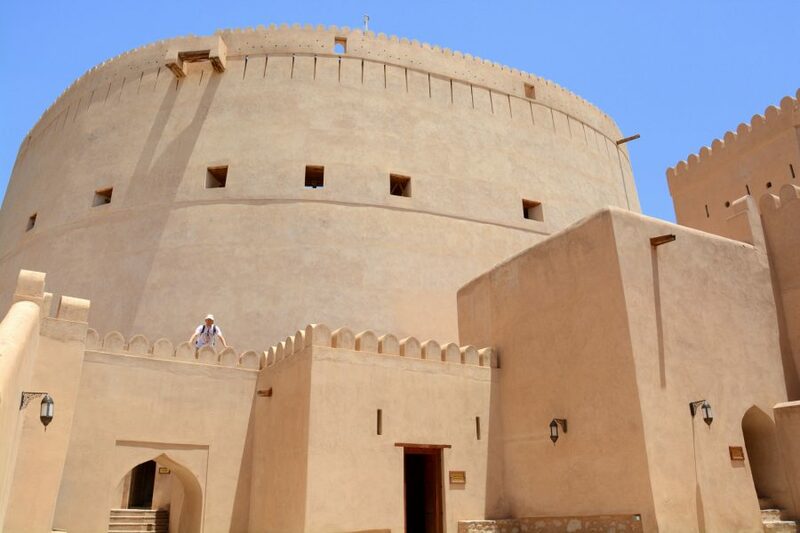 Near Bahla there are two forts worth seeing – Bahla fort and Jabreen Castle. 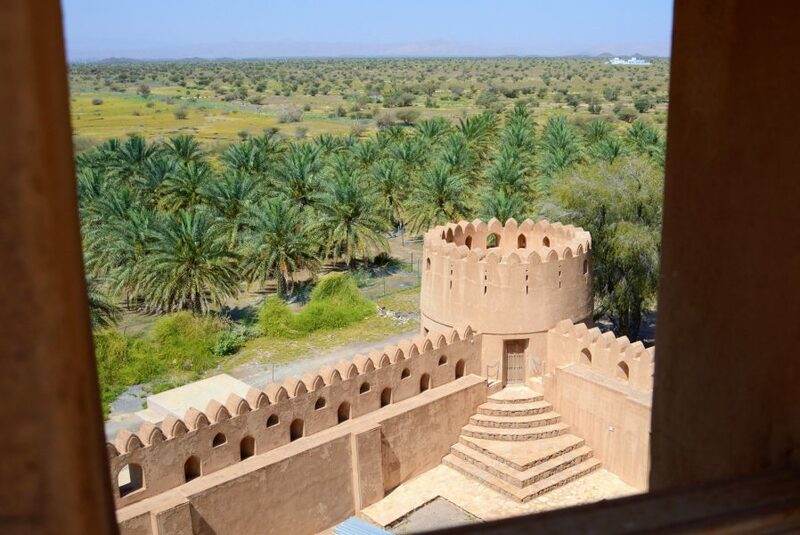 This day go to Jabreen Castle in the morning, we liked it a lot. And then again over mountainous part of Oman. 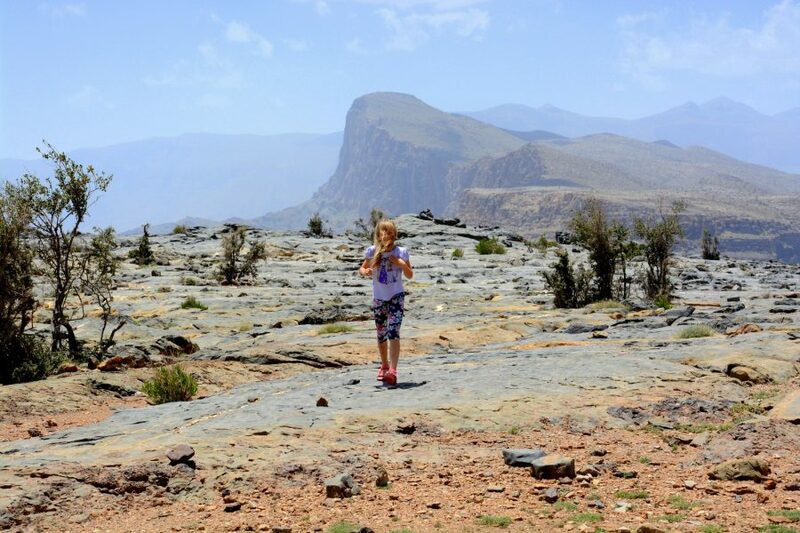 Oman high mountain range has two main parts: Jabel Shams (with famous canyon) and Jabel Akhdar, which is well known by its terraced hills and rose water that is manufactured there. 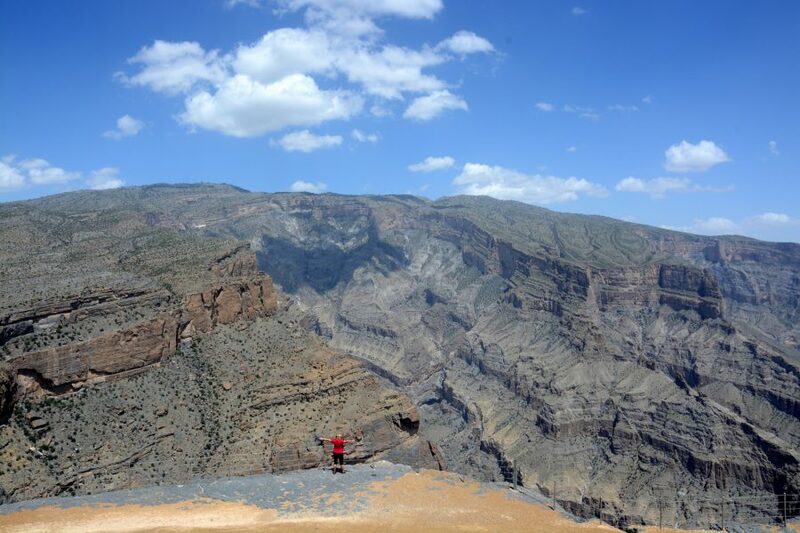 You can go to the canyon with ordinary car, but to the Jebel Akhdar you will need 4W. 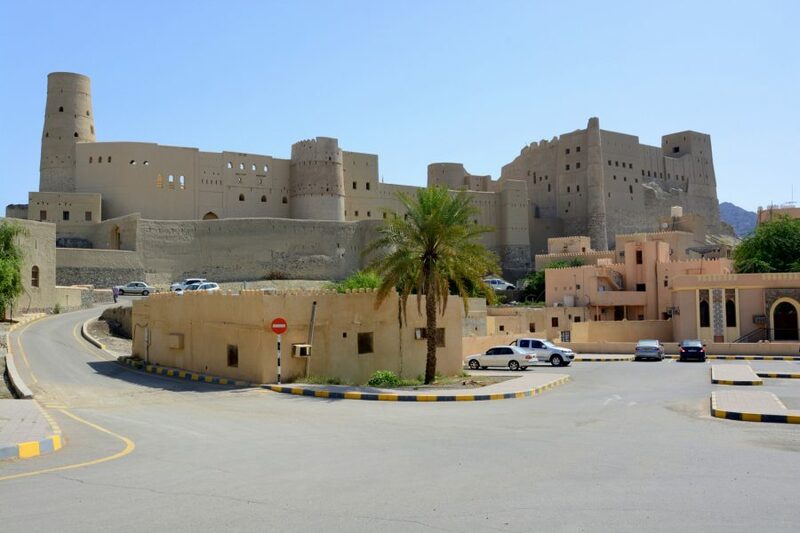 If you rented an ordinary car, you can take guided tour to Jebel Akhdar. 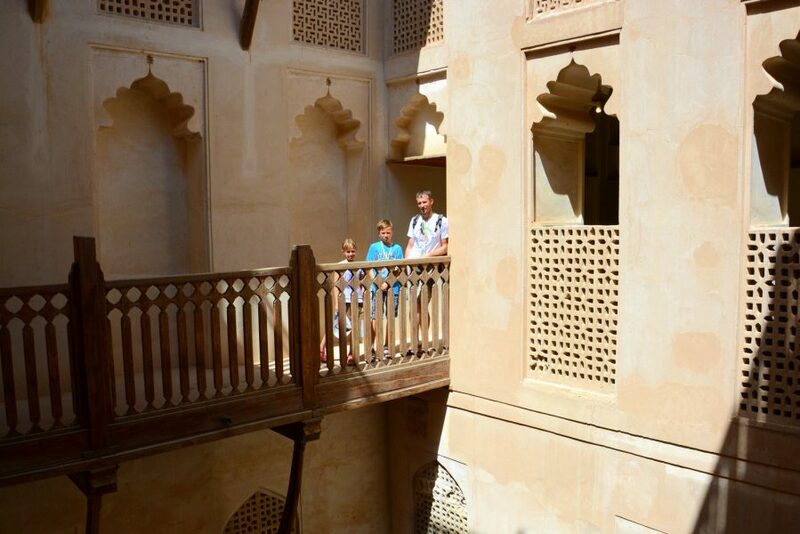 We didn´t do that, but we will certainly come back as Oman charmed us. 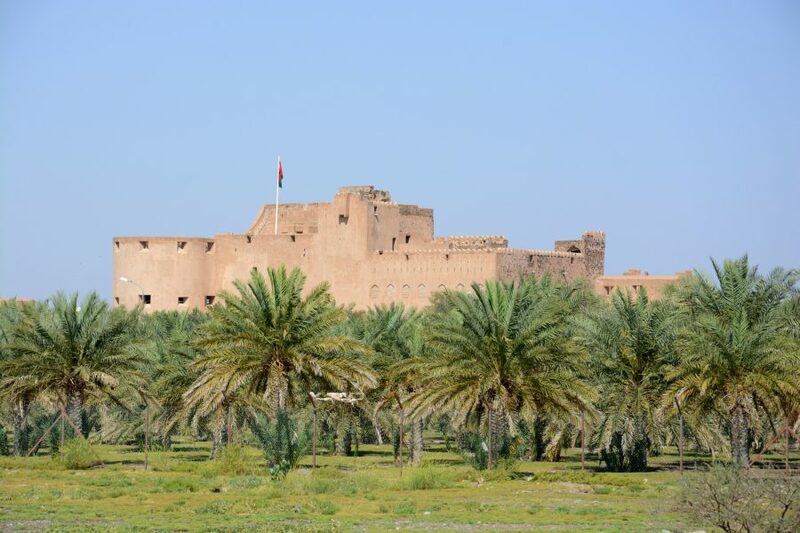 We recommend spending the night in Nizwa or its surroundings. 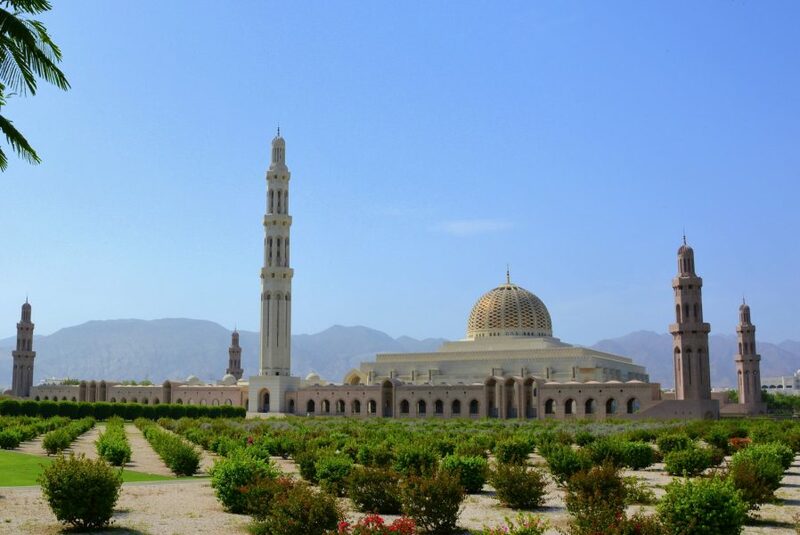 Nizwa is former capital and still offers genuine local city throb. 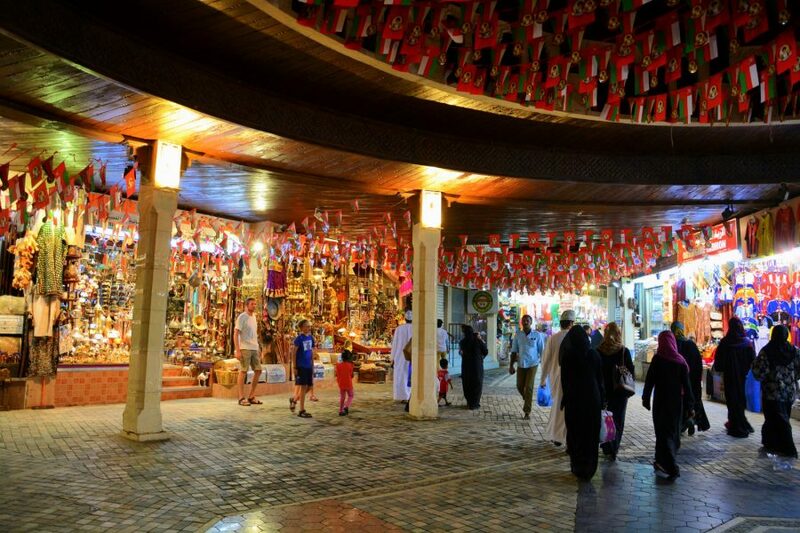 There is well known Nizwa souq – marketplace and goat market every Friday early in the morning. There are numerous stores selling dates, where you are kindly accepted (and they don´t expect anything, not even purchase). But it was crazy hot when we were there. I recommend that you buy Laban – salty yoghurt that is best for quenching thirst. Turks have Ayran (it is phenomenal), they have Laban – we recommend. 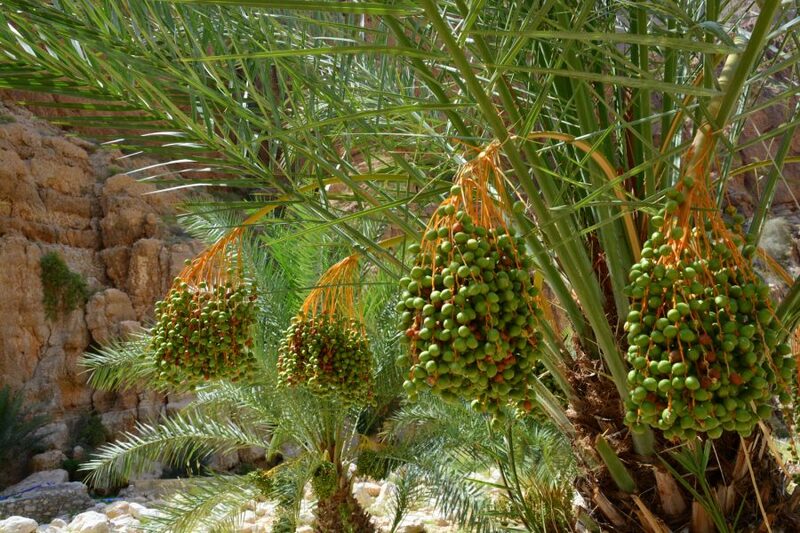 Abd don´t forget to buy the best dates in the world. 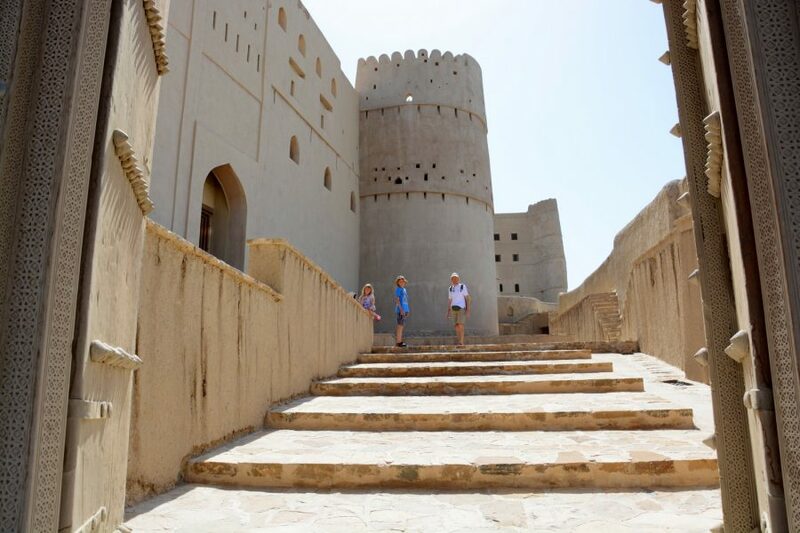 After marketplace, you should explore Nizwa fort, where you can meet only a few tourists. I could count them on fingers of one hand. 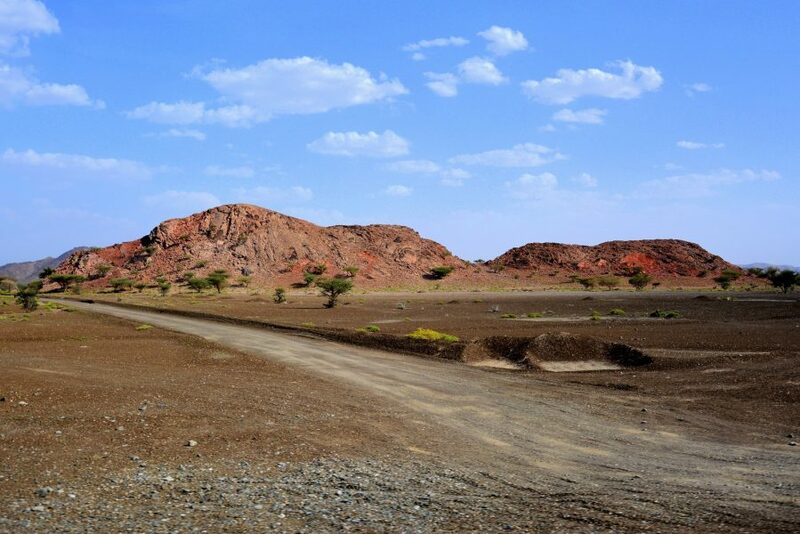 In the afternoon leave Nizwa behind and go towards Wahiba desert. 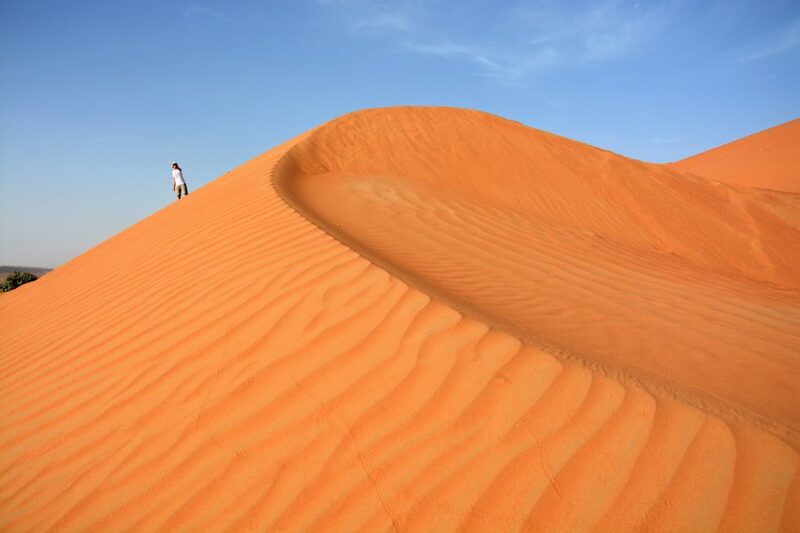 We recommend spending the night in Bidiyah that is closest to the dunes and that´s why the most appropriate for morning exploration of them. 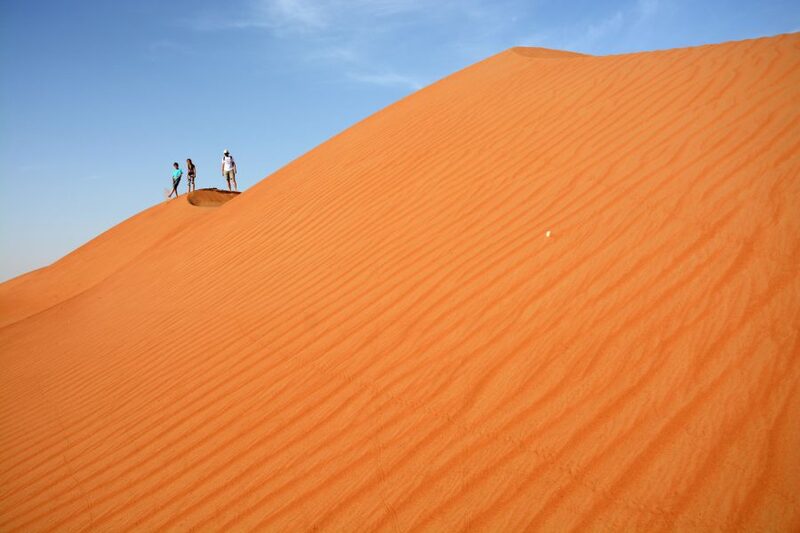 Go to the red and hot dunes of Wahiba desert first thing in the morning and enjoy in the biggest sandpit. We were there until 9 a.m. and after then it was too hot, so I recommend that you wake up early. 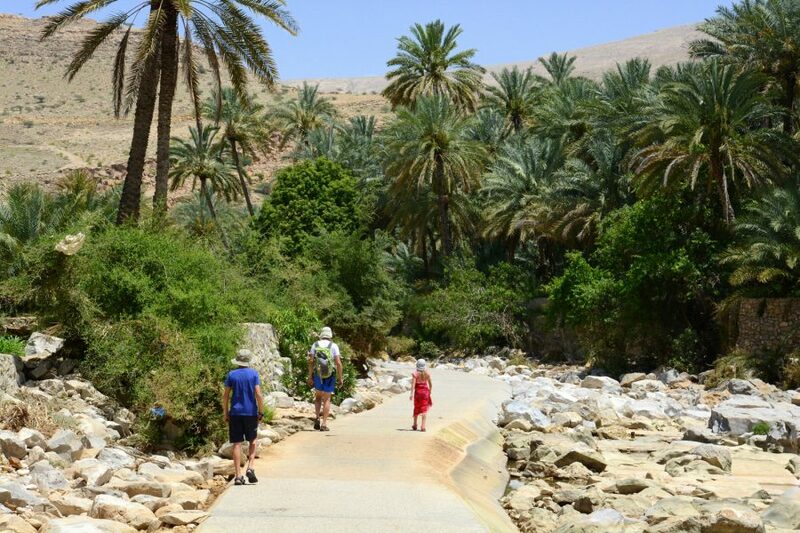 Continue your journey to the first wadi – Wadi Bhani Khalida. 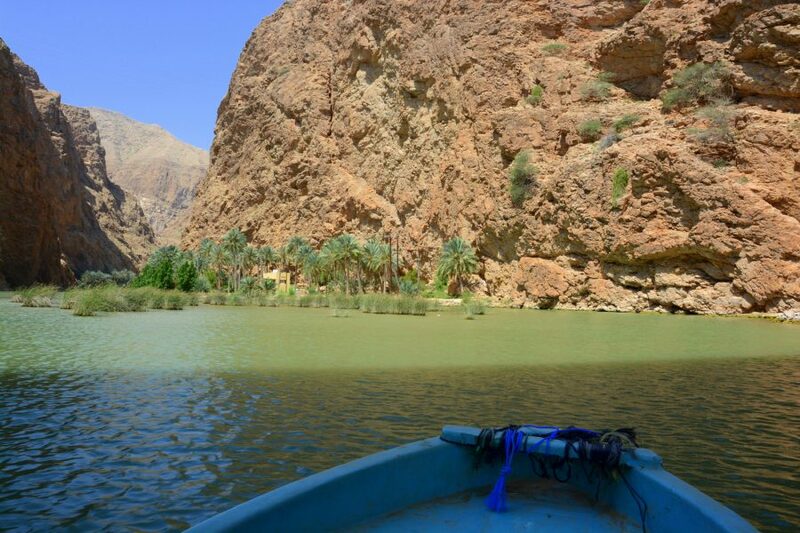 This was the most beautiful part of trip for us – from desert dunes to idyllic green wadi. It was fairytale-like. Continue further more to town Sur and find a place to spend the night. 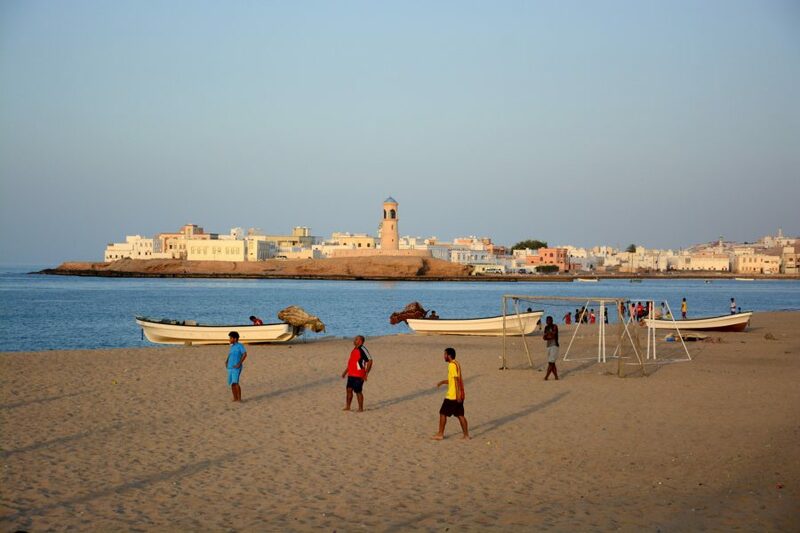 A day for exploring Sur and its surroundings. 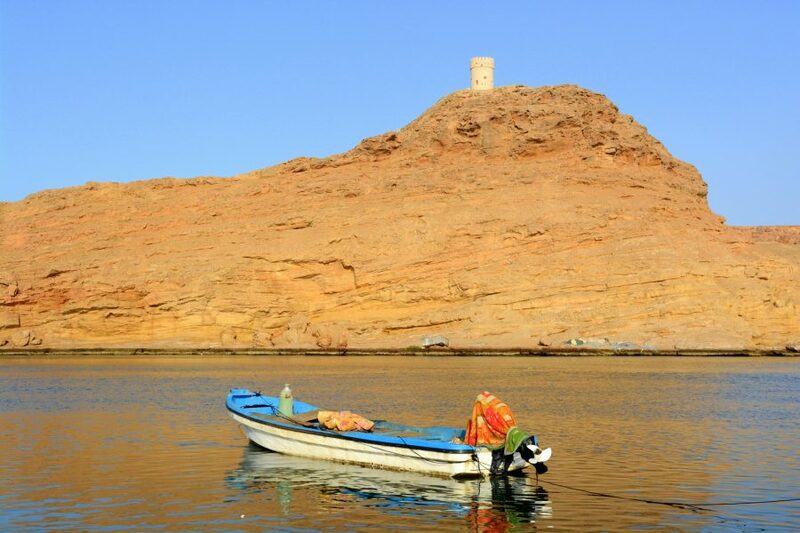 If you like animals, than go to the east edge of aradic peninsula – to Ras-al-Jinz, which is known by turtles that nest there. With some luck, you can observe them, but mainly from sunset to sunrise. We were just enjoying in local city throb of little town by the sea, as we were lucky enough to swim with numerous turtles just a few months ago in Apo island, Philippines. 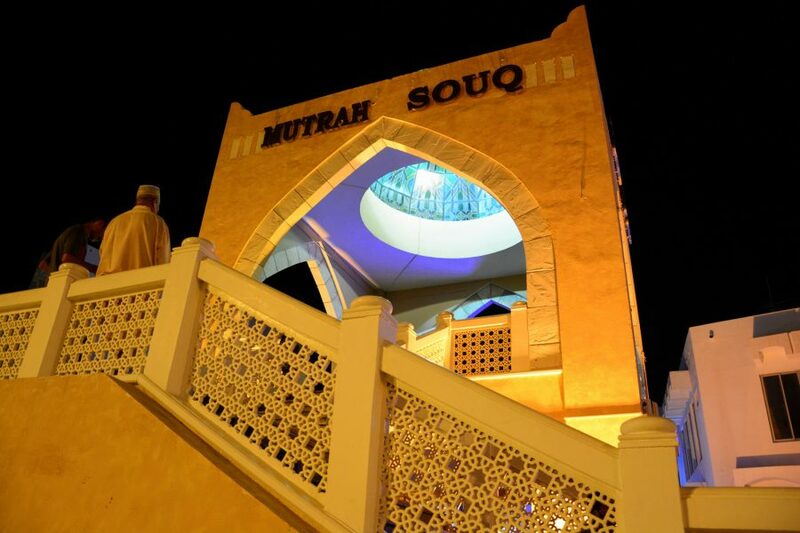 If you don´t have enough time, you can leave out Sur and go further to Muscat. Day for wadi. One more beautiful than the other. 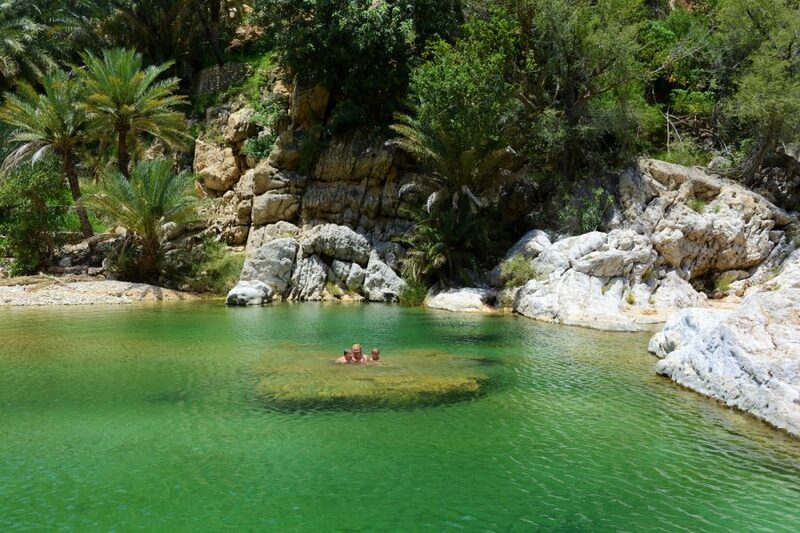 We firs went to Wadi Tiwi, but didn´t bathe in it. 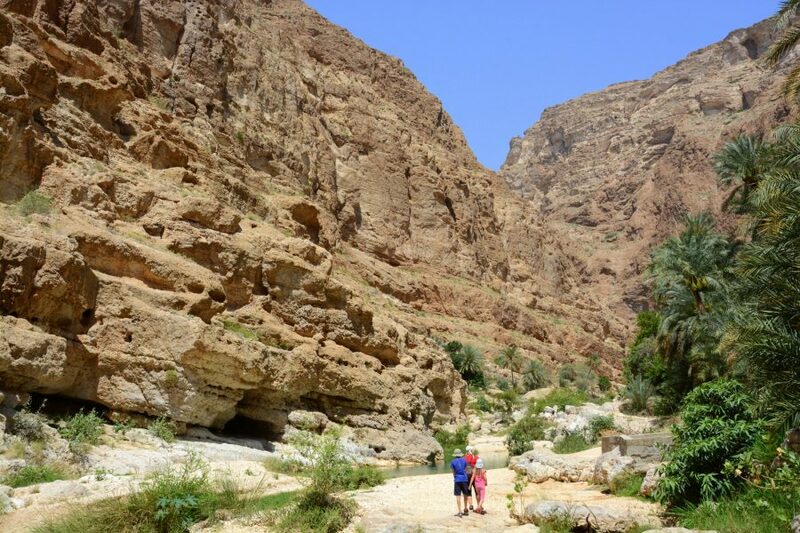 Then we went to famous Wadi Shaba, walked around ravine, and bathed in green pools. You should have headgear and enough water with you. 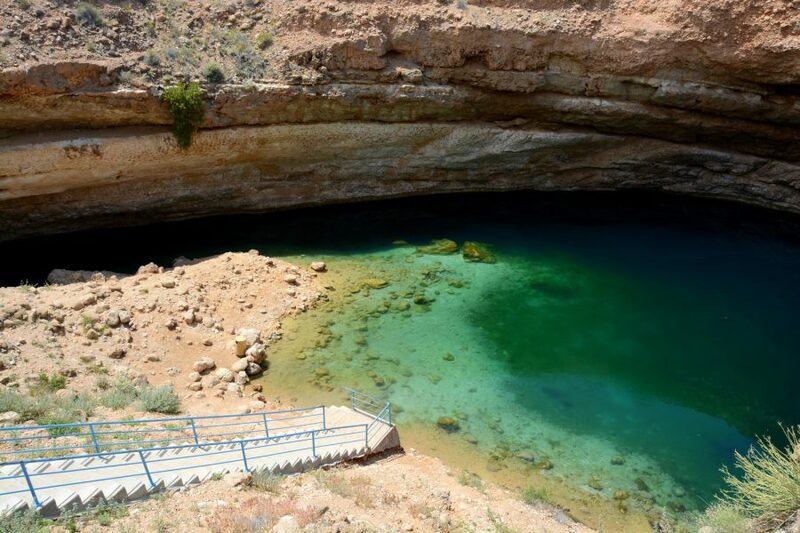 At the end of this day´s journey towards Muscat, stop in Bimmah Sinkhole, special hole with clean turquoise water for bathe and refreshment. It was hard to find, but is worth finding it. Coordinates: N23.03689 E59.07019. 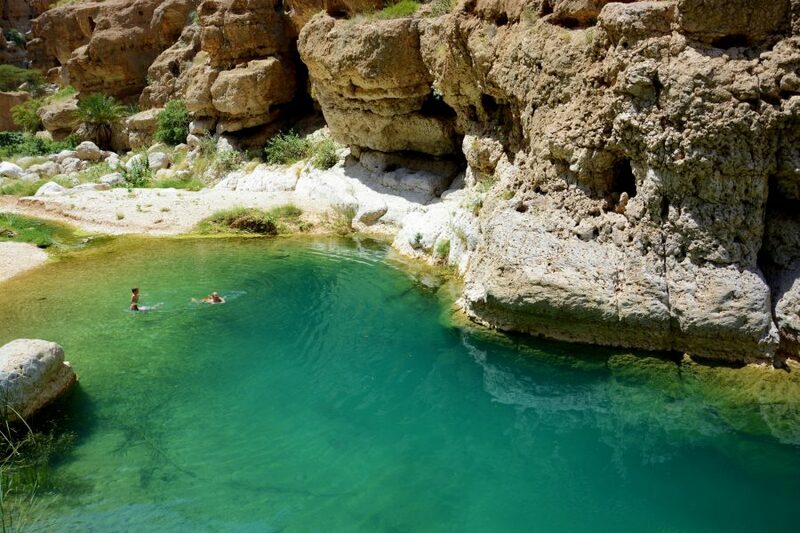 We were bathing in our swimsuits in Wadi Shaba and Wadi Bhani Khalid as there were no locals near. But in Bimmah Sinkhole locals often bathe, so you should use your T-shirt and shorts as a respect of culture of a country where we are guests. Spending the night in Muscat. 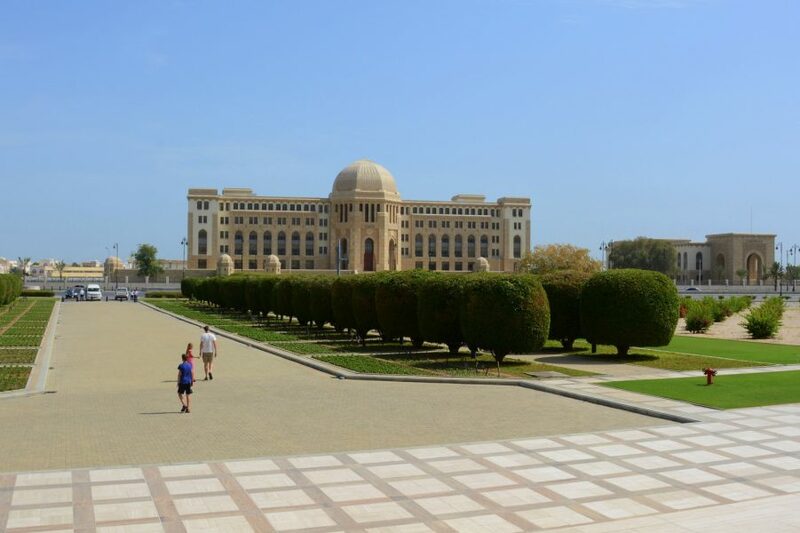 A day for exploring Oman´s capital. 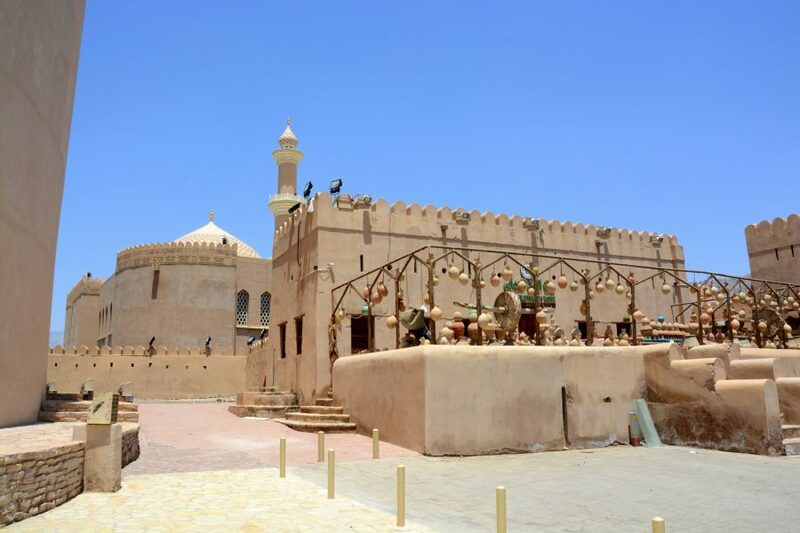 Don´t leave out famous Mutrah souq and fish market and beautiful Sultan Qaboos Mosque, but consider that it is closed for tourist on Fridays. 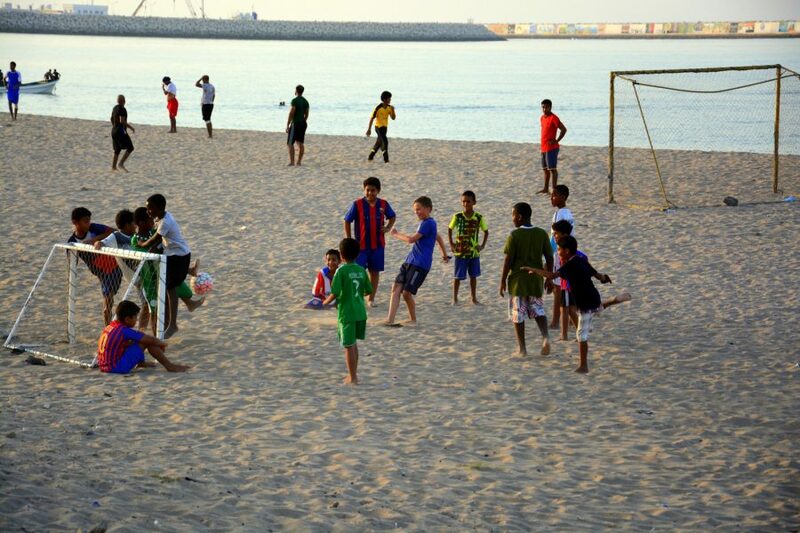 You can cool down in Riyam park near Mutrah souq or in Al-Qurm park. Spending the night in Muscat. It was time for us to go back to United Arab Emirates. 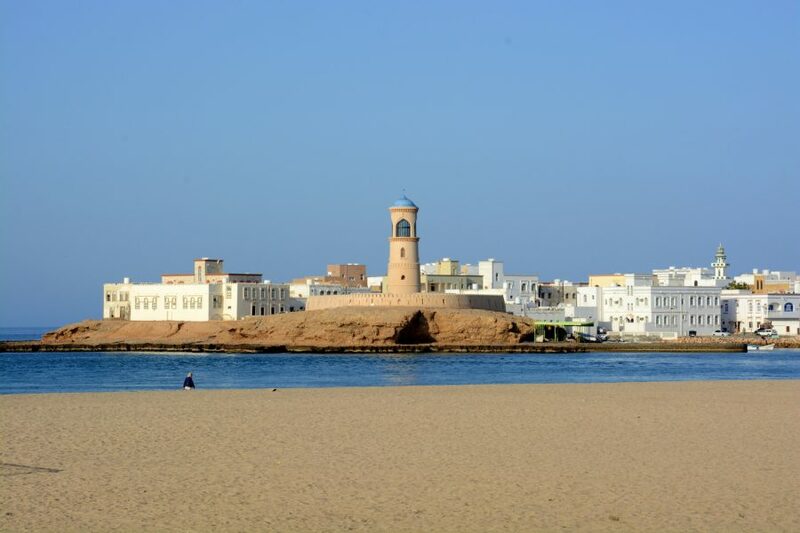 If you have more than 10 days to explore Oman, you can go to the coast, on area between Al Sifah and Yiti beach. To be honest – we were not attracted but we are – as far as the sea and beaches goes – spoiled and maybe unfair. But you can also go on a trip to Daymaniat islands and explore underwater world of coral reefs. 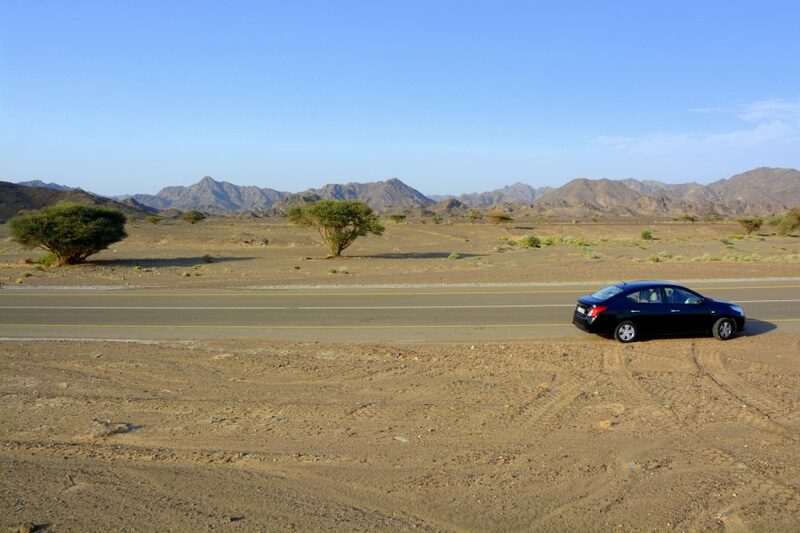 There is a long journey from Muscat to Dubai, so start early in the morning. It is approximately 420 km long path and then border crossing where an additional traveling hour or two can be added. Spending the night in Dubai. 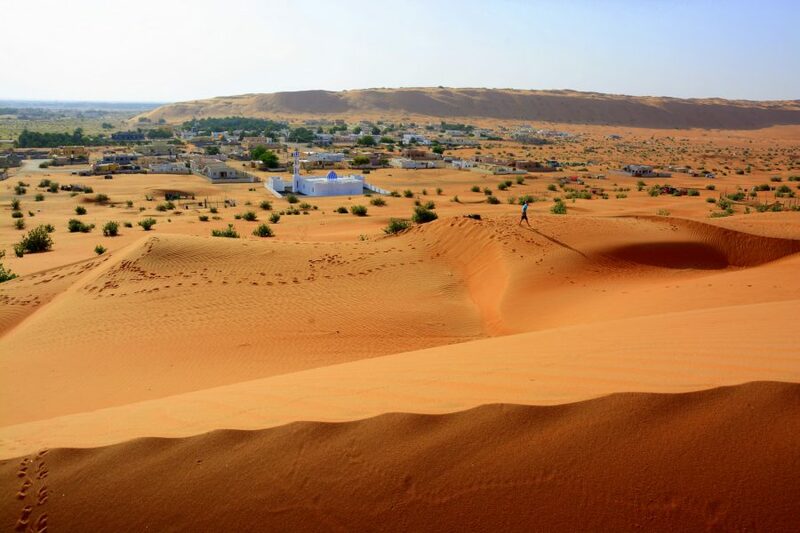 I hope that with this itinerary we made you see Oman as different but beautiful place. 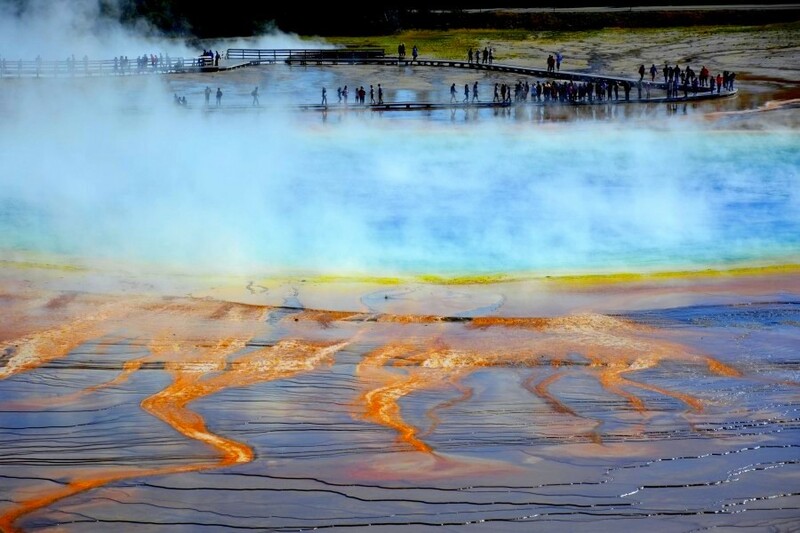 It was one of our most beautiful travels and we highly recommend it. It was the best experience .